Home / Prep Football / Meet the champs: Who are the Patriots? Meet the champs: Who are the Patriots? Christian High coaches following the win over University City on Friday night. UNIVERSITY CITY – Underappreciated, unheralded and flat-out over-looked. 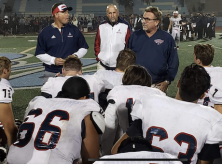 The Christian High Patriots may not collect many individual trophies after the end of the 2018 football season but that might suit the newly-crowned Eastern League champions just fine. The Patriots have hung titles from nearly a half-dozen leagues over the years and were actually on a rare one-year hiatus from holding a title. But this season, a group of experienced youngsters, along with a seasoned coaching staff, has continued the program’s flourishment straight into the upper echelon of the county’s elite. The Patriots’ final regular season power ranking following their 49-28 Eastern League win at University City on Friday night will land them the top-seed in the upcoming Division III playoffs, giving the team a first-round bye. Christian High secured the No. 1 seed by a wide margin. In fact, the Patriots will finish the regular season inside the top ten in the official computer ratings, which are used for playoff purposes. But who are these guys? You might not see them on any awards shows but you can’t miss them in the highlights. And maybe the most overlooked of the Patriots is speedy senior ALEX GONZALEZ. Gonzalez can hurt an opposing football team in so many ways. The Patriots’ team leader in touchdowns found another way to get into the end zone against the Centurions. Gonzalez put the lid on the Patriots’ mad 35-point second half with a 33-yard interception return for a TD to add to his personal trophy case of scores, which includes receiving touchdowns, rushing scores and kickoff returns for six, as well. Gonzalez’s runback provided Christian with a four-touchdown lead after the competitively game Centurions had a pick-six of their own to close the margin to 28-21 after the Pats took a two-score lead after halftime on a 35-yard catch-and-run by Gonzalez, his ninth receiving touchdown of the season. “I felt like coming into the game we kind of underestimated them,” Gonzalez said. “We finally stopped making penalties and once we were able to get our focus on (University standout receiver Casey) Granfors, it was kind of hard for them to really move the ball on us. Christian was flagged at least a dozen times, but mostly in the first half. The Patriots jumped out to a 14-0 lead and led 14-7 at intermission. Senior quarterback OWEN EASLEY had a pair of touchdown runs in the first half. “Owen was on fire and so was ‘Gonzo,’ ” said Riepl, who also had an interception and a touchdown, just not on the same play. Christian’s JUSTIN ROEHL had a 38-yard interception return for a touchdown to add to the pick parade and give the Pats a 28-14 lead. After Easley scored his third rushing touchdown – his 14th of the season – to extend the Pats’ lead to 35-21, he threw a 29-yard touchdown to Reipl. Christian (9-1) will await its fate next week, only knowing it may be facing a familiar foe in the next round, depending on the final seedings. The Division III landscape is dotted with teams the Patriots have met previously this year. The Patriots received a concerning injury in its wide receiver corps. When the game was over, Christian players were happy but seemed more concerned about the focus on the task at hand. After all, winning league championships is the norm and last year was the rarity. “We have so many kids that are really being slept-on,” Gonzalez said. “It can be a good thing, really. When we go into a big game, we have guys that no one really knows about. I think it gives us a little bit of an advantage. MATT ARMIJO had a huge catch during a key scoring drive and JAVIER JIMENEZ was explosive in the run game in the first half for the Patriots. The seniors are part of the ‘who and where’ bunch.